Excel skips certain operations on hidden cells (cells in hidden rows or columns) if your worksheet contains filtered data (a Filter or AutoFilter). For example if you select range A1:A10 and rows 2 till 9 are hidden and you apply a color, then the color is only applied to the visible cells (A1 and A10). However, Excel only skips these cells if your worksheet has and autofilter, otherwise the color is applied to both the visible and the hidden cells. For your information, in previous versions of ASAP Utilities, you had to first use Excel to selected only the visible cells in your selection as a workaround (Excel, F5 > Special... > Visible cells only) if you only wanted the tools to affect the visible cells in your selected range. This tool will change the conditional formatting in selected cells to static formatting. It verifies the formatting that has been applied via conditional formatting (font, color and borders) and then apply that as standard formatting. Settings of font, color and borders will be applied. Data Bars and Icon Sets cannot be made static with this tool. This tool only works with Excel 2000, 2000/XP, 2003 and 2010 (Excel 2007 is not supported). Don't hesitate to experiment with this tool, it has and undo. 'We work a lot with conditional formatting (in Excel 2003), but our client wants us to �freeze� the format (Yes, that means no more �conditional�...) in order to have a classical Excel format (mainly cell and font colours). Add the value formula as comment. 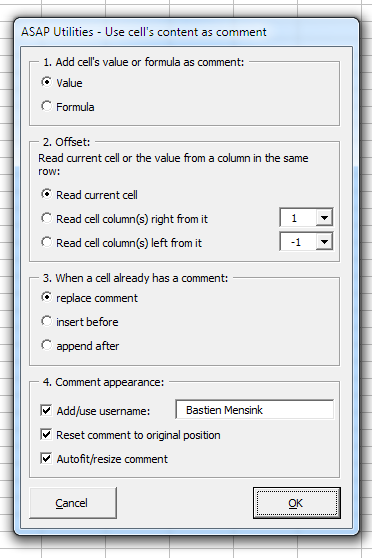 You can choose replace existing comments or add the value at the beginning of the end of an existing comment. Don't hesitate to experiment with this tool, it has an undo. This tool has been updated so that besides the yyddd and yyyyddd now the JD Edwards (AS/400) cyyddd format is also supported. Their system adds a 0 or 1 in front of the year representing the century (0 = 1900, 1 = 2000, Jan 15, 1910 is 010015, Jan 15, 2010 is 110015). Skipped the confirmation at the end "The data has been copied to the clipboard". This was removed by request from users who used this utility a lot. 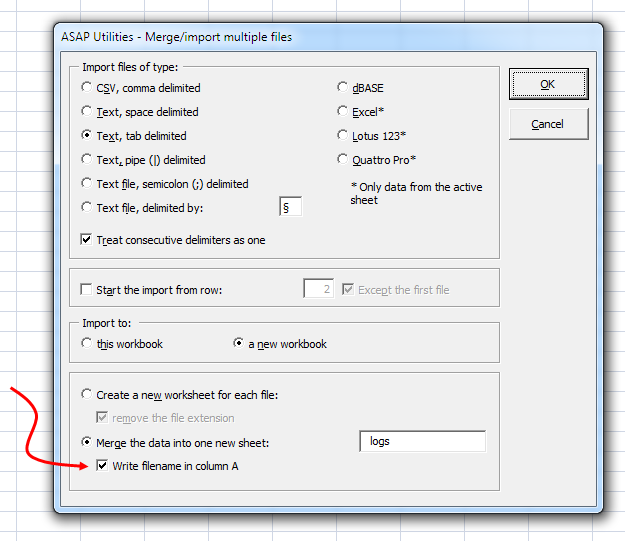 New, when you merge the data you can now choose to have the filename listed in column A. 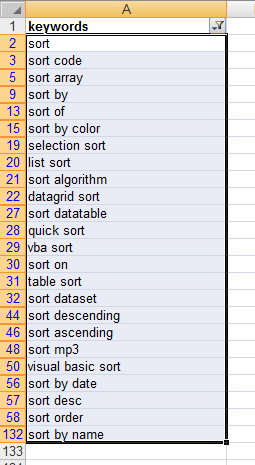 This utility used to delete all hidden rows and columns together. You can now choose to either delete all hidden rows, all hidden columns or both. "Export selection or active sheet as new file..."
With French regional settings in Windows this tool gave an error. This is now fixed. In Excel 2007 and 2010 when you had selected the entire sheet and started this utility it raised an error. That is now fixed. 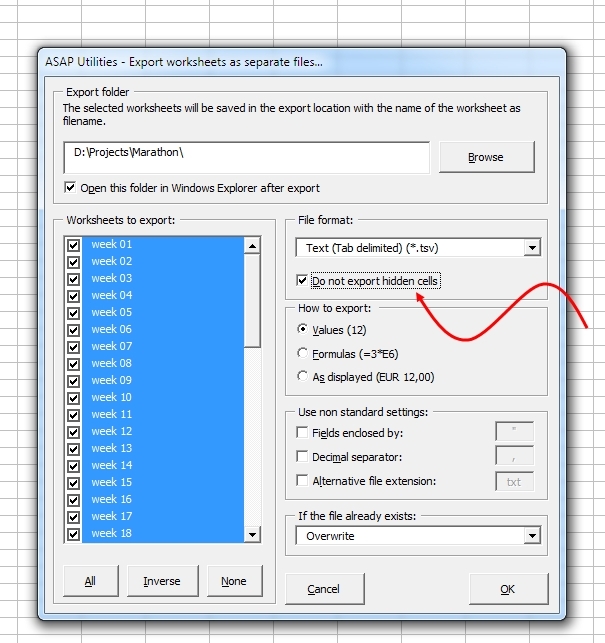 When you have only selected one single sheet, ASAP Utilities selects them all for you, but that gives an error if you have any hidden sheets in your workbook. This is now fixed by automatically selecting only the visible sheets. In version 4.7.2 we have updated this tool so that it automatically adds http:// in front of hyperlinks if needed. However if you link to a file and the link doesn't start with a drive or folder letter, it is treated by the tool as an internet hyperlink and http:// is automatically placed in front of it. We've have now updated the tool by using a better detection for internet hyperlinks. Didn't work if your selection contained cells with an error. This is now fixed. Could produce an error if you had selected multiple non-adjacent columns. This is now fixed. Fixed the bug that caused your chosen range to expand if your given columns or rows included merged cells. "When using "Select cells based on content, formatting and more..." and finding no cells matching the search criteria, I expect no cells to be selected. But in fact all cells from A1 to End-of-Sheet are selected!" If you have a single cell selected and then start the utility, the tool then assumes that you want to search in the entire workbook and pre-selects that. However, if no matching cells are found the entire sheet was still selected. This is now fixed. The first newly created worksheet doesn�t contain the first couple of selected rows (depending on how far the selection is from the top of the sheet). For example, if I want to split range A3:A12 (10 rows) into two sheets with 5 rows each, the first two rows are lost." Fixed the bug that caused the export to the clipboard as TAB delimited to be empty. "Sorry, something unexpected went wrong at code line 800: Error 6: Overflow". Fixed two bugs that we found (but so far have never been reported). Improved reliability for the undo when your worksheet/selection was filtered. 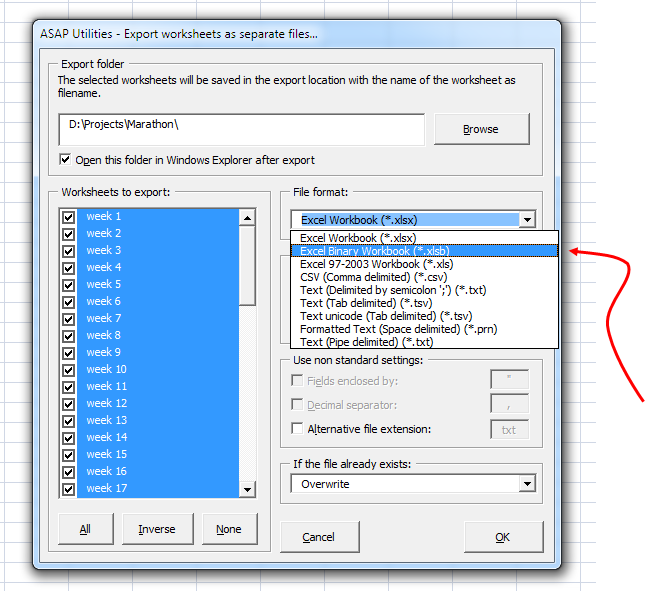 If the worksheet contained an autofilter and frozen panes then the freeze pane settings could become altered in some cases due to an Excel bug. This is now fixed.